To say that Seth MacFarlane the creator of hit comedy animation shows, Family Guy, American Dad and The Cleveland Show; likes Star Trek is a little bit like saying that water is wet! A self confessed Trekkie, MacFarlane has a great love for the franchise and even stared briefly in the fifth incarnation of the show Enterprise. It was not really much of a surprise when it was announced in 2017 that the actor turned director would be the show runner on a brand new science fiction series called The Orville for the Fox Network, and while some initially thought that it would be just Family Guy in Space, it turned out to be greater in scope than anyone could have hoped for. Now in its second season and riding high with both critics and fans alike, The Orville is the little show that could, and while it is unique in its own way, many are dubbing it the Star Trek show that the fans wanted, rather than the current incarnation of Star Trek in the new show Discovery! Even though The Orville is now into its second season, merchandise has been pretty thin on the ground and besides a few tee shirts, pins and a distinct lack of toys. 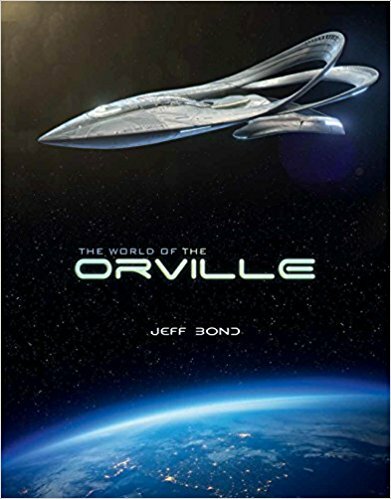 Recently The Worlds of the Orville was released, a 160 page hardcover coffee table book by Jeff Bond from Titan Books and to date is the only real piece of merchandise for the show available. My look through the book is below over on our YouTube channel! 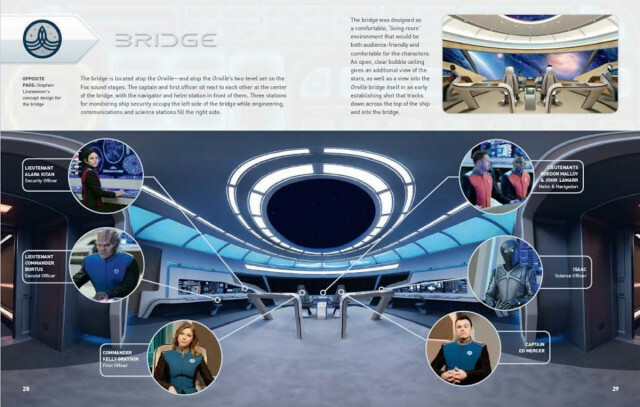 With a lavish cover featuring the shows other main character, the U.S.S Orville ECV 197 herself, to the highly illustrated interior that features dozens of concept sketches, behind the scenes photography and insights into what it takes to bring the show to life. With an introduction by legendary show runner Branon Braga (Star Trek The Next Generation, Star Trek Voyager), the book starts off as it means to go forward and offers some great insights into how a huge television show goes from concept to your screen. 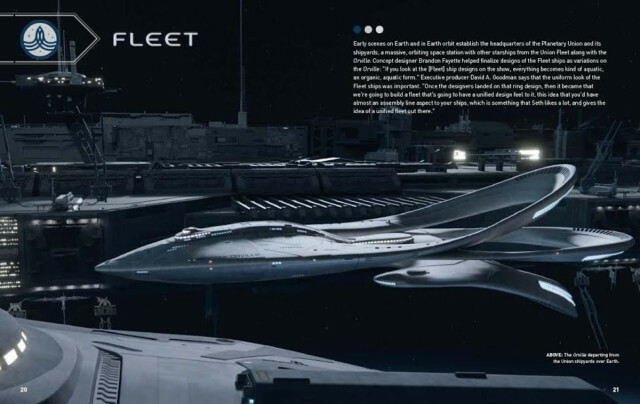 Layout is uncluttered and well thought out and the book follows a natural progression through the shows chronology, introducing the reader to the various characters from Macfarlanes Captain Ed Mercer, his estranged wife Commander Kelly Grayson (Adrian Palicki, Agents of Shield), and Doctor Clare Finn( Penny Johnson Jerald Star Trek Deep Space Nine) to supporting characters such as the CGI gelatinous blob like character Yaphit (voiced by veteran comedian Norm MacDonald). 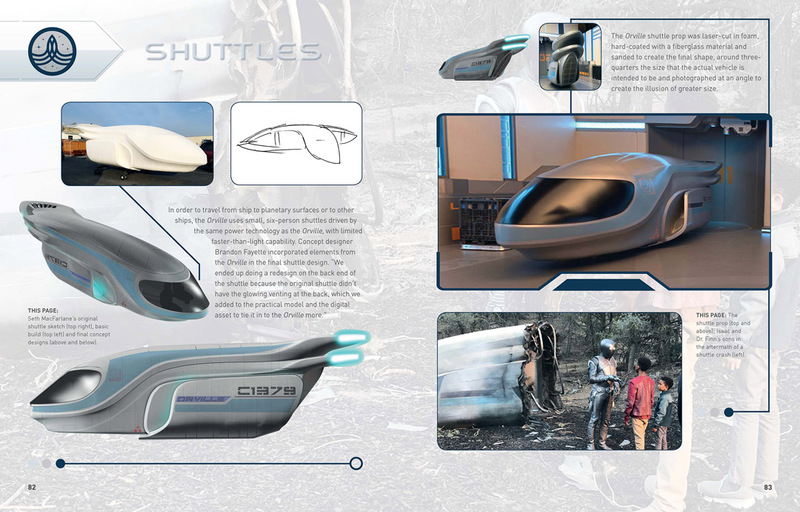 There are general insights into the make up of the show, with input from designers and artists as well as MacFarlane himself, such as turning Peter Macon into the alien Lt. Commander Bortus, following the stages of design from conception to finished on screen presence. 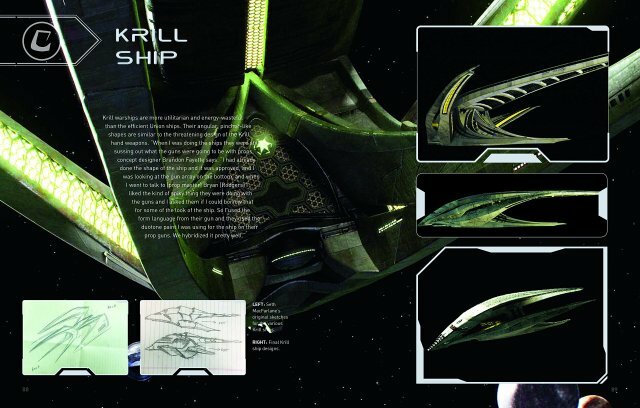 An in-depth look at the Krill the alien protagonists of the shows first season, and much more! Overall the book looks at what it takes to make a mini movie each week and bring it to the television sets of millions of viewers worldwide, and as a book about the making of a show it is great value for money. However as a reference book for those who wish to create costumes or props based on The Orville it is invaluable and well worth its weight in gold. There are dozens of photos, all in high resolution that cover almost ever aspect of the show, from Eds office, the bridge and sickbay, to the props such as medical tools and weapons and much, much more. It is perhaps the details on the uniforms that is the best presented and gives a perfect visual reference for anyone wishing to cosplay as an Orville crew member, right down to the rank insignia on the outfits. And seeing as the uniforms are designed by Joseph Porro who has designed costumes for some of the most iconic programs and movies of the past thirty odd years, there is a lot to check out! Given that there is next to no merchandise for this hit show, this is a book that any fan will really want to pick up and though it has a retail price of £29.99 here in the UK I managed to get my copy for £17.70 from eBay so it pays to shop around! A great book with amazing imagery, clear and well laid out and a great addition to any science fiction fans collection. As a guide for cosplayers it is invaluable and I can see this being the ‘Go To’ book for many in the hobby. Images © Fox Network/ Titan Books all rights reserved. Respectfully, I stopped reading about halfway through. The grammar is atrocious. There are awkwardly constructed run on sentences throughout, to make no mention of the severe lack of commas and apostrophes. I bought the book more for the visual aspects for costuming, rather than the background information to be honest. While it is present, there is a lot that could have been explained far better and some parts omitted completely! That said I do think it is a pretty well laid out book, but also appreciate your feedback.